Vermont could be poised to make marijuana history this year. The state is considered a prime candidate to legalize recreational cannabis in 2016 – not through voters, but via lawmakers. That would be a first for the industry: Although numerous states have legalized medical marijuana through the legislature, the handful that have approved recreational cannabis have done so at the ballot box. Some observers thought Vermont’s legislature was going to legalize recreational marijuana in 2015, but that didn’t happen. Now they’re hoping it’ll be in 2016, and two bills to do so have already been introduced and are ready for the public to read. If either bill passes and then clears Gov. 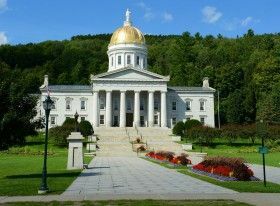 Peter Shumlin’s desk, Vermont’s rec industry would dwarf the state’s medical cannabis industry, which generates just a few million dollars in revenue annually. Vermont would be able to draw scores of marijuana tourists from the East Coast, particularly if no other states in that region legalize in 2016. Senate Bill 241, by state Sens. Jeanette White and Joe Benning, would allow for up to 173 commercial cultivation licenses, 84 retail permits and 42 cannabis lounges. The inclusion of cannabis lounges would also be a first for recreational marijuana legalization. Senate Bill 95, by Sen. David Zuckerman, is quite similar, as it would allow for licensed lounges, as well as cultivators, retailers, product manufacturers and testing labs. There are some key differences, though. For example, Zuckerman’s bill doesn’t explicitly limit how many business licenses the state could issue, but it would pave the way for a Marijuana Control Board to enact rulemaking that could set such caps. Zuckerman’s bill would also set an excise tax of $40 per ounce on cannabis flower and $15 an ounce on “any other marijuana” – i.e. edibles – and $25 on any immature plant. White’s bill leaves tax rates to the rulemaking process. While White’s bill would not allow edibles at first, Zuckerman’s explicitly permits infused products. One final real difference between the two for business owners: Zuckerman’s bill would set up a fee structure for companies. Cultivators would pay an annual fee of between $1,000 and $50,000 depending on the size of the operation, product manufacturers and testing labs would pay an annual $5,000 fee, retailers would pay $30,000 a year and lounges $10,000. White’s bill would leave fees to the rulemaking process. So does either bill have a shot? That’s up in the air. White thinks she might be able to get her bill passed – though she wavers on the overall odds. On days when she’s optimistic, White feels that the bill as structured now is hard to oppose. “If people really read it and they knew what was in there and they knew all the safeguards we put in it, they wouldn’t have many arguments against it,” White said. Other days, she thinks some of her peers in the legislature will come out against it no matter how it’s structured. Sometimes she gets an “emotional response” from other lawmakers who “don’t care what’s in it, they’re just going to oppose it because they don’t like the idea,” White said. If one of the bills does pass, it will likely look a lot different than it does today. White said her bill will certainly change in the legislative process, possibly in a substantial way. Her bill was introduced on Jan. 5 and was immediately sent to the Judiciary Committee, where it is currently awaiting its first vote. It’s the same for Zuckerman’s bill. White said legalization in 2016 will be an uphill battle, but she expects cannabis to have a powerful ally in Gov. Shumlin, who called earlier this month in his State of the State address for lawmakers to approve legal cannabis. But he also called for them to pass “the right bill,” and didn’t take sides on which of the two competing measures he would prefer. The proposed taxes and fees are too high. $40 per ounce tax is roughly a 20% sales tax and $25 per immature plant is higher than the cost of of clones (in California at least). But I suppose that’s the price of freedom from arrest. No mention is made of whether home growing would be decriminalized. Homegrown is not going to be decriminalized in VT, it’s off the table. Notice that lots of the money from the taxes are going to law enforcement. Another case of inequality with the rich getting richer and and the poor just paying up the wazoo. Sometimes she gets an “emotional response” from other lawmakers who “don’t care what’s in it, they’re just going to oppose it because they don’t like the idea,” ….Here’s to working FOR the people, those of you who just “don’t like the idea”… want to keep office?